The term ju is often translated as soft, weak, or gentle, and this may give a misleading idea about the nature of jujutsu techniques. Indeed, the techniques are based upon the principle of flexibility in redirecting or countering an opponent's force, but this certainly does not mean that they are soft or weak (this was already nicely described in 1988 by my friend Stephen Fabian in his article "Jujutsu: A Preliminary Analysis of Methodology"). Gentleness and strength go together as natural complements, forming the basis for jujutsu: the soft and the hard, yin and yang (in Japanese in and yo). Whereas initial softness is a good way to redirect an attack, it will usually be followed by the appropriate application of strength to finally overcome the opponent. Although many would say that the basis of this philosophy comes primarily from Chinese Taoism, I like to stress the importance of the natural selection of techniques that were tried and tested for their effectiveness in periods where this was still possible. Close combat methods were initially developed for use on the battlefield. Schools that originated in the Sengoku jidai (1467-1603) use techniques appropriate for men wearing armor, called katchu bujutsu. Apart from the use of weapons, these techniques also included grappling while wearing armor or yoroi kumiuchi. Since the final goal was winning the battle and killing the enemy, the strategy of that period was based on offense. However, in the Edo period (1603-1867), the major battles were over and the country knew a long period of relative peace. The bushi no longer needed to use their armor but instead prepared to be effective in daily situations, wearing normal clothes. Techniques from that period are sometimes referred to as suhada bujutsu, literally "naked fighting techniques," meaning unarmored and dressed in the normal street clothing of the period. Although the major pitched battles were past, the martial attitude continued to flourish. Of course strategy changed and more emphasis was placed on occasional encounters with one or several opponents in daily situations. In this context it was important to constantly be aware of potentially dangerous situations and consider how to make use of the environment in order to gain advantage over the enemy, including escape possibilities in case of an ambush. Capturing the enemy or toritsuke also became important, since protection of a domain also required information on the intentions of the enemy. Techniques to defend oneself and capturing the enemy without killing him were incorporated into the curriculum of schools like Hontai Yoshin-ryu. These techniques include the hojo waza that involve the use of a cord, called hojo, to bind the enemy. If needed, any available rope could do the job and certainly the sageo (the cord attached to the sword) was a good alternative. In some schools, the obi (belt) is also used to demonstrate some of the less sophisticated techniques. Most of the surviving old schools are still very combative in nature and attach great importance on strategy. In this context heiho, the martial tactics that make the difference between winning and loosing a fight or a battle, should be mentioned. The importance of strategy was already well recognized in earlier Chinese works such as the writings of Sun Tzu, and although these classics were studied by the Japanese, there was a need to adapt them to the very precise situations in which the bushi operated. The importance of strategy is probably best illustrated in Miyamoto Musashi's books Hyoho Sanjugokajo ("Thirty-five Instructions on Strategy"), written in 1641 for Hosokawa Tadatoshi, daimyo of Kumamoto Castle, and his more famous work Go Rin no Sho ( "Book of Five Rings"), written in 1645 for his disciple, Terao Magonojo. Musashi also wrote Dokkodo ("The Way to Be Followed Alone"). These days, members of the Hyoho Niten Ichi-ryu regard the books of their founder as manuals of technique and philosophy but many others refer to Go Rin No Sho as a true reference on strategy for all swordsmen. Also in Hontai Yoshin-ryu, references to aspects of heiho are frequent and important. A formal discussion of strategy, including the art of taking a position (kurai dori), is part of the transmission, but students are made aware of the importance of strategy as early as possible, because the art is combative in nature. 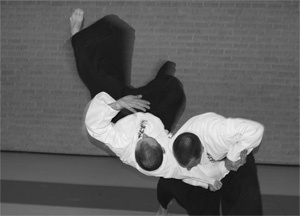 Gyaku or joint locks are very characteristic of jujutsu schools. In daily Japanese, gyaku means "opposite." In many budo, however, it refers to the techniques that consist of manipulating joints opposite (gyaku) to their normal range of motion. Some notion of human anatomy is required to understand the line in which force on a joint can be optimally applied. It is therefore quite understandable that in the past, many teachers of jujutsu have chosen to become bonesetters (a Japanese practitioner of joint manipulation to treat pain and dysfunction) in their professional life. This is also the case in Hontai Yoshin-ryu where several highly ranked teachers used to be professional bonesetters. Nage, is in the mind of most people, almost naturally associated with jujutsu, probably because of the emphasis on throwing in judo, which was derived from jujutsu, but is better known to the public at large. 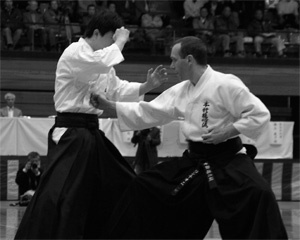 Throwing techniques or nage waza are also frequently used in Hontai Yoshin-ryu, although most of the time in combination with joint locks (gyaku), and hitting techniques (ate waza). While in the official curriculum (of most traditional schools), emphasis is put on the correct execution of the techniques, I want to mention that for daily practice it is also very important to learn how to be the receiver (uke). In the context of nage waza, the term ukemi (receiving body) is often used to refer to the skills needed for falling safely. The role of uke, however, is not always passive. Indeed, the more advanced students often take this role to either facilitate the execution of the techniques or to the contrary, but in a later stage, to challenge the execution by resisting or even anticipating a technique. Ate, although correctly translated as such, is not just hitting. Attacking the opponent's vital points (kyusho) is indeed much more effective than just an occasional blow towards an unspecific target. 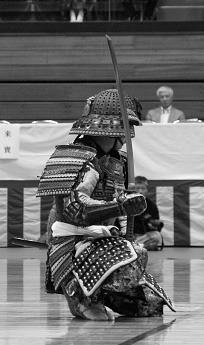 There has been a clear evolution, however, since the time when the body was protected against many striking techniques by armor, and this can still be observed in koryu that include techniques that originated before the Edo period. Although atemi (hitting the body of the opponent) can obviously be used to cause damage, it can also be a way to help break balance; this concept is known as ate kuzushi. Ate waza (hitting techniques), however, are not always present in kata. Nevertheless, even when omitted in kata, they can play an important role in a real situation. They are often part of the hidden techniques (ura waza) that are not accessible for those who only know the kata at a superficial level or by imitation. Apart from a strategic point, i.e. not sharing all the secrets of the school with others, there is also a didactic reason for not relying too much on ate kuzushi. Indeed, by performing the kata in its purest form, the student is obliged to search harder for the true directions in order to break balance. Shime, or choking techniques consist of compressing the upper airway and/or compressing the major blood vessels that supply the head. However, these techniques can be dangerous and require some degree of maturity because even in a training situation inappropriate use of force can lead to unconsciousness or even death. Moreover, shime is an important part of the traditional transmission (den) in Hontai Yoshin-ryu and can not be discussed in detail in articles. Toritsuke, or capturing the enemy, has already been mentioned and katsu (resuscitation), which in fact is also still part of the traditional teachings (den), is somewhat beyond the scope of this article. Apart from the gyaku, nage, ate, shime and toritsuke techniques as such, some other concepts are key. For instance kuzushi or the loss of the opponent's balance is one of the major objectives in many weaponless kata. For it is precisely at that moment of stealing his balance that it becomes possible to control him. In some cases, kuzushi is achieved by simply amplifying the attacker's own force: a push can be countered by a pull and a pull by a push. This is applying the basic tactic of non-resistance, the willow bending in the wind. Sometimes more dynamic tactics can be employed, ranging from precise applications of pressure, to well-directed strikes, or as already mentioned, ate kuzushi. Gyaku (joint dislocations), and even nage (throws), are commonly achieved through application of the lever (teko) principle. 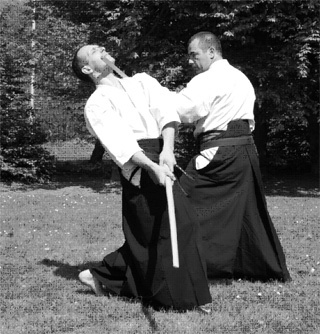 The fulcrum (shiten) of the lever is usually a part of the body placed strategically beneath or upon a joint or weak body point of the opponent. Another tactic used to achieve kuzushi is to consider both feet of an opponent to form two angles of a triangle: force applied along (or in parallel to) the line running between the two feet, will be the least effective, as this is the direction with the greatest resistance. In contrast, forces that are applied perpendicular to this line between both feet, will meet much less resistance. This principle is often called "completing the triangle." Demonstration of ma-ai by Inoue soke (19th soke) and his son. Optimal use of ma, the space (or interval), between oneself and the opponent is also a key element in mastering the art. Although distance is a major part of the interval between two things, time is equally important and is therefore also incorporated in ma. Often in budo, when confronting an opponent, three stages of distance are described: toi ma, which is the long space that is initiatory; itto issoku no ma, which is a ma where a single step by either opponent will bring them into range of the other; this distance shows engagement; and finally chikai ma, which is called close distance, and is therefore the decisive distance. Ma-ai or "meeting the distance" is essential for each combative situation but varies according to the weapon used (or lack of weapon), or the weapon being faced. Control of ma-ai, is possible only through mastery of tai sabaki, the body control or movement in response to an aggressive act. Tai sabakihas been described by the 18th soke, Inoue Tsuyoshi Munetoshi, as one of the most important physical components of Hontai Yoshin-ryu. Attitude and postures that indicate fighting engagement, called kamae, are often formally studied. However, contrary to what one might think, a kamae is not a posture in which one does not show a single target that is vulnerable to attack. On the contrary, a kamae will often display an opening that invites an attack. In such a way, the attack to come will become more predictable and therefore easier to handle. All this is part of the strategy or tactics of fighting. In a martial context the proper use of timing, often referred to as hyoshi, is also essential. Especially when one has to obtain kuzushi on an attacking opponent, there is almost always a small window of opportunity where the opponent is still too much engaged in his movement and not yet fully stable. In the more advanced stage, optimal use of timing evolves even to the ability of imposing timing onto the opponent (i.e. to encourage the opponent to attack when you are expecting him most). In Hontai Yoshin-ryu, this is best illustrated by comparing the technique uen from the kodachi kata with uen from hanbo. Both start from seigan no kamae and both initially move forward to force the opponent with the sword in a jodan no kamae. However, the tactics to allow the opponent attack are quite different. With the kodachi, the opponent is invited to come in by gradually lowering (slightly towards the outside) the hand which holds the kodachi. By remaining very calm and by creating an opening in the kamae, eventually the opponent will succumb to the urge to attack. With the hanbo, however, the lowering happens much faster and once the opponent (holding the sword) is in jodan no kamae, the hanbo can be moved slightly up and down, creating a wave or pattern that is very difficult to resist. The opponent is very likely to attack in this rhythm, allowing very efficient execution of the hanbo technique. Timing, distance, and appreciation of the opportunity all lead to the ability to take initiative, captured in the word sen. Traditionally, there are three major combative initiatives described: go no sen, which is the initiative after an enemy has already launched his own attack; sen no sen, where one prepares to meet an attack (also called saki), and sen sen no sen, where one anticipates an attack (also called sen-no-saki, kakari no sen). All these initiatives can determine the outcome of an encounter, which could be: katsu (victory); make (defeat), or ai-uchi (mutual killing). In modern budo, ai-uchi is an acceptable outcome for a confrontation. 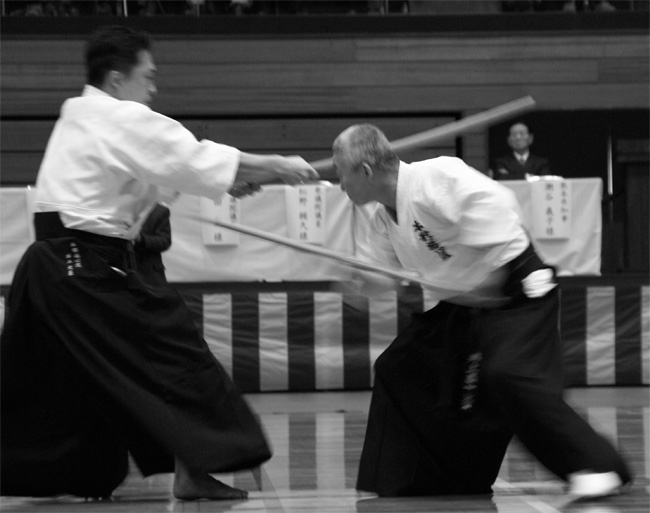 During kendo or karate competition for example, an ai-uchi or mutual execution of an effective technique is ignored in the scoring and the fight is continued. In older budo, this is not the case, since ai-uchi would lead to mutual death, an unacceptable outcome. A samurai would never attempt ai-uchi except when faced with an unavoidable confrontation with an opponent with known superior fighting skills. In that case ai-uchi would be a possible tactic and he might be willing to engage a technique to kill his opponent, knowing that there is a risk to be killed as well. This concept of risk-taking is very important. Certainly with bladed weapons, being touched by the opponent while attacking him is far more dangerous than risking a blow to a non-vital part of the body from an unarmed opponent or from a training partner with a non-cutting weapon, who is controlling his movement. In fact, ai-uchi can be written using two different characters (kanji) for uchi: the first translates as beat, attack, defeat, conquer; the second is closely related but slightly different and translates as attack, defeat, destroy, conquer. Also closely related is kobo itchi (although this term is less used in Hontai yoshin-ryu). Kobo itchi is the concept in which the priority of offensive or defensive action depends on the appropriateness of the situation. This concept was regarded as very important by Kano, himself a jujutsu expert and founder of judo, who believed that attack and defense can often be seen as two sides of the same coin. During practice (or in battle), purification of the mind is often realized by the use of kiai. Since kiai enables one to liberate mental and physical force very rapidly, it is often used to influence another who is in close proximity. This influence can range from a pure tactic to impress an opponent, to a transfer of energy as sometimes used in resuscitation techniques. The proper use of kiai, only comes after longer periods of training. Until then, most practitioners only imitate the shouting of their teacher. This is also because in kihon or even some kata, kiai can sometimes be formalized to train the students on how to use it. The 18th soke Inoue Tsuyoshi Munetoshi used to require junior high school students to alternate the sounds "hey" and "ha" during kihon training with the long stick (called cho bo or rokushaku bo). During my stay in Japan, I used to accompany soke during these trainings, and I have imitated his example with my students for a long time. I hope they now realize that sometimes kiai is essential, but sometimes it was imposed purely for didactic reasons. 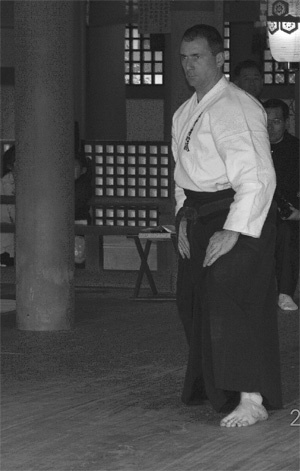 In Hontai Yoshin-ryu, like in many schools, an attitude of vigilance and alertness is studied by formally including zanshin as part of the kata, before and after executing the techniques. Students learn that they must be ready for any offensive, even when the encounter seems finished. "Zanshin" or this high state of awareness, vigilance and alertness, is sometimes translated as "to stay with spirit," i.e. to be in a state where concentration remains until necessary. Zanshin should by no means just be a fierce grimace or a stance of rigid aggression. On the contrary, true zanshin is vigilant calm, allowing a state of awareness without focusing on, therefore not being distracted by any phenomenon. This is in line with the philosophy of Takuan (1573-1645), who originated several principles that influenced many great samurai. Although Takuan was a Rinzai-sect Zen priest, his teaching to swordsmen was also very Taoist-based, with elements borrowed from Shingon Esoteric Buddhism. Takuan's philosophical discourses had a great effect on the further development of several traditional schools, especially on the development of the kenjutsu school Shinkage-ryu, and even the great swordsman Myamoto Musashi is said to be inspired by his teaching. One example from Takuan's principles is mushin (no mind; original mind), a state of mind that is not fixed upon anything and therefore open to everything. When the mind is not fixed, it will not be troubled by appearances. Another example is fudoshin (unmoving spirit/heart; immutable in heart), the state of mind that is not troubled by anything. To strive for fudoshin means that one will have no fear when confronted with danger or unexpected events. To conclude this section, I want to comment on a common misunderstanding about jujutsu. Indeed, the term jujutsu is almost always used in a restricted way to refer to weaponless fighting. Although I am not able to comment on other schools, certainly in Hontai Yoshin-ryu, the philosophy of the art can be applied in all situations, including armed confrontations. A good example is hanbo oku, in which the stick is used against the sword in five of the six typical jujutsu principles (or techniques or strategies) from the school, referred to as jujutsu roppo uchi goho. 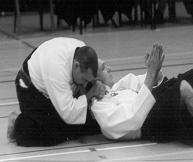 The first technique of hanbo oku is an application of toritsuke or capturing (catching) the enemy; the second is ate or hitting, followed by nage or throwing, gyaku or joint lock; and finally shime or choking (strangling). 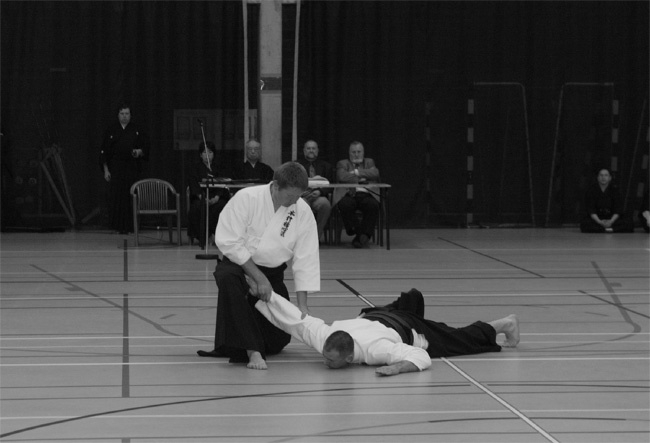 Note that, since the sixth technique of jujutsu roppo in Hontai Yoshin-ryu is katsu or resuscitation, you will not find it in any of the kata or forms of the school, but it is an important part of the transmission. In Hontai Yoshin-ryu, if one feels the need to classify kata into categories, the words emono kata for weapon forms, and toshu kata for weaponless forms, can be used. In part 3, I will continue with some reflections on training in the art.